Search giant's CEO talks about how the company plans to overcome the challenges it faces. 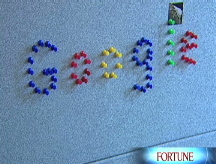 SAN FRANCISCO (Fortune) -- As Google's CEO, one of Eric Schmidt's duties is to represent the company in public. Co-presidents and co-founders Larry Page and Sergey Brin limit their appearances, presumably because they value their privacy, but also because they seem to prefer it that way. Less time glad-handing means more time thinking big thoughts, working with their fellow Google engineers and, frankly, kitesurfing and other recreational activities. As for Schmidt, dealing with the public, including the media, means defending and explaining Google (GOOG, Fortune 500), a time-consuming task given the still intense interest in the company, nearly four years after its blockbuster IPO, from all corners of the globe. On the last day of March, two and half weeks before Google reported impressive financial results that defied predictions of an economy-affected slowdown, Schmidt sat down with Fortune's Adam Lashinsky at Google's headquarters in Mountain View, Calif., to discuss Google's reputation, its challenges and what impact the company is feeling from the departures of some of its key employees. Fortune: Is Google somehow immune to the various negative factors that hit every other company? Schmidt: No. Google is not immune to any of the problems that companies face. In fact, Google faces them faster because of our growth. It seems that one of the media's favorite topes is the When-will-Google-fall story line. Well, take Fortune. If you go back and you read the articles over a five-year period, they've all had this sort of, "yes, but" (section). That's not a criticism. It's perfectly reasonable reporting, but I would read them and I would say, well, do I believe that the "yes, but...." is going to become the thing that will hurt the company? My conclusion was we would overcome it. One of the things to understand is that a properly scaling organization will address the challenges and overcome them, right? And a poorly run company will either deny those challenges exist, which is just stupidity but people do it, or they will fail to address them. They won't have a forum. In other words, they'll keep doing their old thing. What, then, are the most important challenges? They are always about leadership. At a corporate level, history says that leaders in their markets are almost always knocked off their leadership position by their own actions and not by actions of others. If you look at the press coverage it's all focused on external threats but the biggest threat is internal, and it's not just true of Google, by the way. What type of internal threats? The simple one is the threat of distraction. I'll give you an example. You could imagine that Google Apps [the company's Web-based package of word-processing, spreadsheet and e-mail programs that mimics Microsoft's Office franchise] taking over 90 percent of our time. We don't allow that because we're disciplined about spending a lot of time on our core businesses. We hope at some point Google Apps will become a core business, but today it's not, so [that's] a threat of distraction. How do you respond to criticism that Google does only one thing well, search-based advertising, and that the rest of the company's new products haven't lived up to their hype? It's materially false that there's not much going on. The evidence is that we are in one of our most productive phases. Remember, you'll never get a successful answer to that because the whole idea is to collapse everything into Google rather than having brand new, separate brands. So, from your perspective, you sit there and you go, well, what's new? It looks like Google. Does it become increasingly difficult to run Google as it grows beyond a certain size? You ended 2007 with almost 17,000 people. Microsoft (MSFT, Fortune 500) has 70,000 employees. Is it harder to get things done in Microsoft at 70,000? Well, the answer that's probably more interesting is how has it changed from 7,000 to 70,000. We certainly could have a big company organized into 20 small companies. That's called divisionalization. We went through this at Sun (JAVA, Fortune 500) [where Schmidt was chief technology officer] and I'm rather cynical about it. The argument is that divisionalization allows you to have general managers who then make operating decisions that are fast moving. The problem with that is if the customer wants an integrated experience it now looks like they're looking at a federated experience. So you don't get leverage. We talk a lot about this issue, and we're trying to do the inverse. We're trying to run a large company well, which is not an oxymoron. How concerned are you by recent executive departures to companies like EMI and Facebook as well as to startups like Ooyala, Mechanical Zoo and FriendFeed? We're going to have some of that. Our attrition is very much lower than any other company of our size. People tend to stay at Google. Some percentage of people will do that but it's very small, and the reason is that startups are not a very good exit vehicle right now. Nobody's going public because of the market. Startup incubation time is long. I teach venture capital at Stanford so I've studied this very carefully.